According to the newly released World Trade Statistical Review 2016 by the World Trade Organization (WTO), the current dollar value of world textiles (SITC 65) and apparel (SITC 84) exports totaled $291 billion and $445 billion respectively in 2015, but decreased by 7.2 percent and 8.0 percent from a year earlier. This is the first time since the 2009 financial crisis that the value of world textiles and apparel exports grew negatively. However, textiles and apparel are not alone. The current dollar value of world merchandise exports also declined by 13 percent in 2015,to $16.0 trillion, as export prices fell by 15 percent. In comparison, the volume of world trade grew slowly at a rate of 2.7 percent, which was roughly in line with world GDP growth of 2.4 percent. WTO says that falling prices for oil and other primary commodities, economic slowdown in China, a severe recession in Brazil, strong fluctuations in exchange rates, and financial volatility driven by divergent monetary policies in developed countries are among the major factors that contributed to the weak performance in world trade. 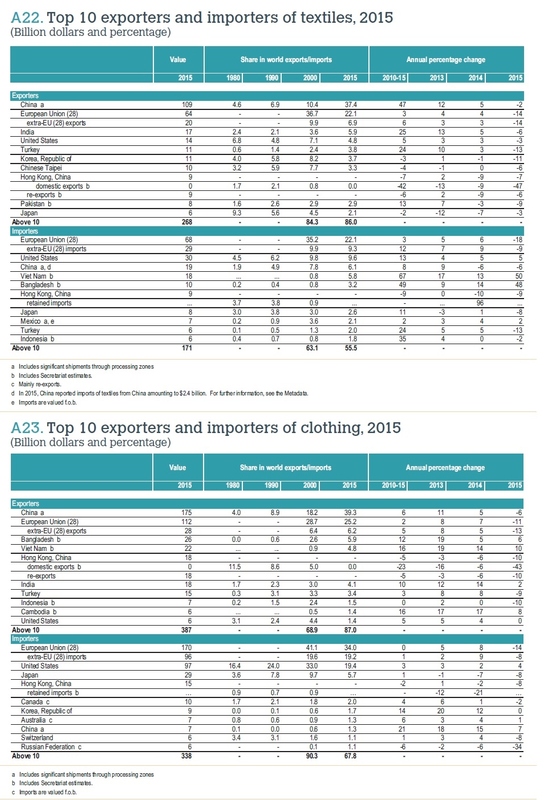 China, the European Union and India remained the top three exporters of textiles in 2015. Altogether, they accounted for 66.4 percent of world exports. The United States remained the fourth top textile exporter in 2015. The top ten exporters all experienced a decline in the value of their exports in 2015, with the highest declines seen in the European Union (-14 percent) and Turkey (-13 percent). The smallest decline was recorded in China (-2 percent). Top three exporters of apparel include China, the European Union and Bangladesh. Altogether, they accounted for 70.3 percent of world exports. 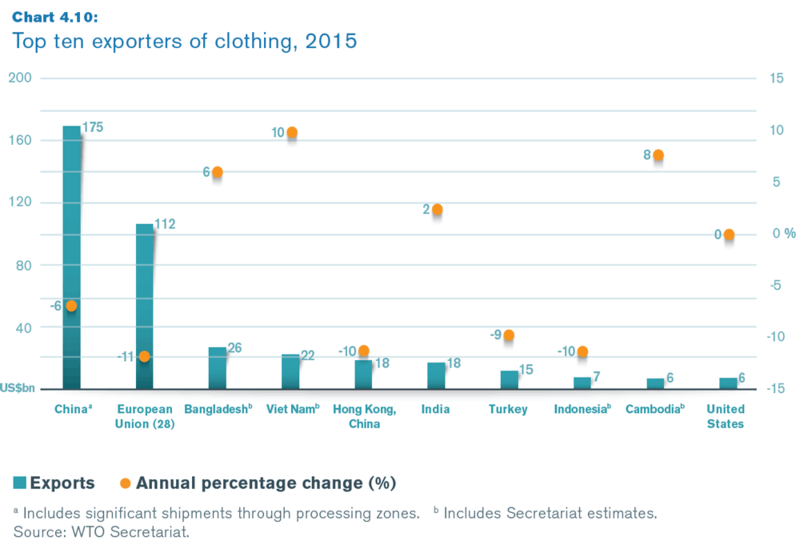 Among the top ten exporters of apparel, increases in export values were recorded by Vietnam (+10 percent), Cambodia(+8 percent), Bangladesh (+6 percent) and India (+2 percent). The other major exporters saw stagnation in their export values (United States) or recorded a decline (all other top ten economies). Additionally, despite reported rising production cost, China’s market shares in world textile and apparel exports continued to rise in 2015 (see the figure above). 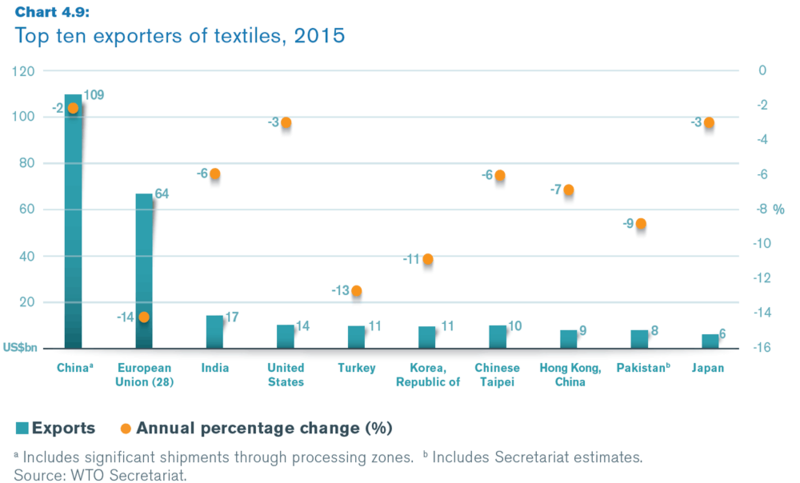 The European Union, China and the United States were the top three importers of textiles in 2015. However, altogether they accounted for only 37 percent of world imports, down from 52.8 percent in 2000. 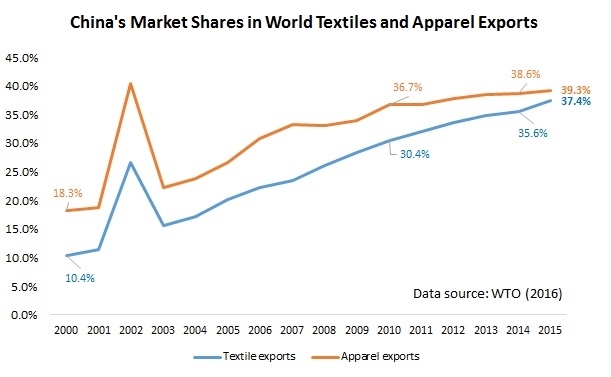 Because a good proportion of textiles made by developed countries (such as the United States) are exported to developing countries for apparel manufacturing purposes, the pattern reflects the changing dynamics of world apparel manufacturing and exports in recent years. Because of consumers’ purchasing power (often measured by GDP per capita) and size of the population, the European Union, the United States and Japan remained the top three importers of apparel in 2015. Altogether, they accounted for 59 percent of world imports, but down from 78 percent in 2000. This indicates that import demand from other economies, especially some emerging markets, have been growing faster over the past decade. The current dollar value of world textiles (SITC 65) and apparel (SITC 84) exports total $291 billion and $445 billion respectively in 2015, but decreased by 7.2 percent and 8.0 percent from a year earlier. Why did it happen? Does it associate with trade policy? If the TPP passed at that time (negotiations concluded in October 2015), I think it would increase dollar value of world textiles and apparel exports because of a free flow of goods in the global economy. Nevertheless, not only apparel and textile, the current dollar value of world merchandise exports also declined by 13 percent in 2015. Thus, the decline of world textile and apparel exports must also related to the ability of consumption from consumers. It’s great that you start to think about the impact of trade policy on trade flows. Yes, TPP was officially reached in Oct 2015, but the agreement hasn’t taken effect yet. This article offers some interesting perspectives on the phenomenon http://www.economist.com/blogs/economist-explains/2016/10/economist-explains-5 but personally I am not very convinced that “protectionism” is the main cause. Although this article was relatively concise, I learned some important facts. First, I did not know the European Union was in the top three exporters of textiles and apparel. I feel we as Americans spend so much time focusing on Asian and South and Central American countries when it comes to T&A exports, that we don’t necessarily think of heavy consumer nations as main exporters. Secondly, according to this article, the current world value of textile and apparel imports have both decreased for the first time since the 2008 recession. This is due to a variety of reasons, but do you think this will happen in the near future again? Or do you believe world exports will continue to grow positively like they have been? Next Next post: How is China’s Garment Industry Dealing with Rising Labor Costs?